A gateway in forwarding mode will forward all the user connection requests to a pre-configured gateway. Gateways in forward mode are useful if cascading firewalls are in use, to separate WAN connections from LAN connections and make it possible to disconnect WAN segments in the event of issues without disrupting the LAN. Note: Multiple Gateways are needed to configure a gateway in Forward mode. Prepare a server which would be able to reach external and internal networks. Configure firewall rules properly following the article: Firewall Requirements for Remote Application Server. Once prepared, go to RAS Console > Farm > Gateways > click Add> specify the server name or IP address > Set Forwarding in the Mode field and specify the Forward to option (should forward to existing gateway that's in normal mode). 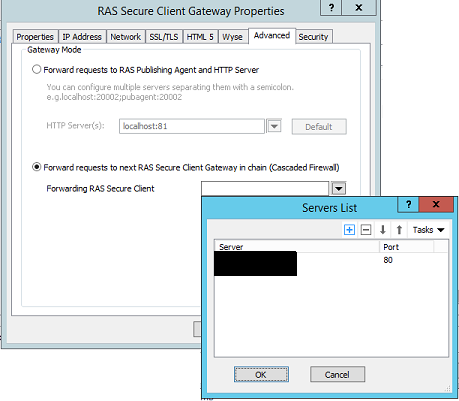 Forwarding settings can be modified in the RAS Secure Gateway Properties in Advanced tab.